Clock Grand Opera Boegli.The latest signed Boegli called Grand Opera. The latest signed Boegli called Grand Opera. Model of jaw Switzerland with round dial, the first with this feature, the ‘clock is dedicated to the men from the classic style, timeless. The strength of the Grand Opera is the dial consists of 3 levels at the base with elegant blue screws. 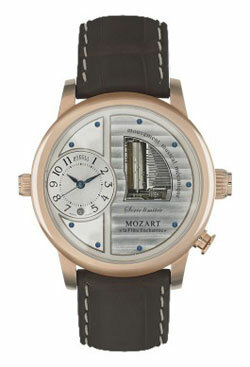 Moreover, the particular working with Cotes de Geneve (Case ribbed parallel made with a cutter that leaves thin streaks) that is visible on the right side, makes this model unique for a result of great visual impact. Through the sapphire crystal, the dial you can see the mechanism refined musical keyboard with 17 notes sounding “The Magic Flute” by Mozart. The melody begins when you press the button positioned at 5 o’clock. It stops when the button is pressed again. The clock is true is just to the right, at nine o’clock, and is located at a deeper level than the main dial. To emphasize the uniqueness of this collection, Boegli decided to enrich Grand operates a sophisticated alligator leather strap complete with butterfly buckle. By Boegli Grand Opera is a limited edition of only 99 numbered pieces and is also available in black, stainless steel or two tone.